Stuffed scallion pancakes and garlic chili sauce. My kids would probably say I'm the best mom ever if I brought them hot lunch at school every day but I don't. Once in a while, though, I do bring special lunches to surprise them. 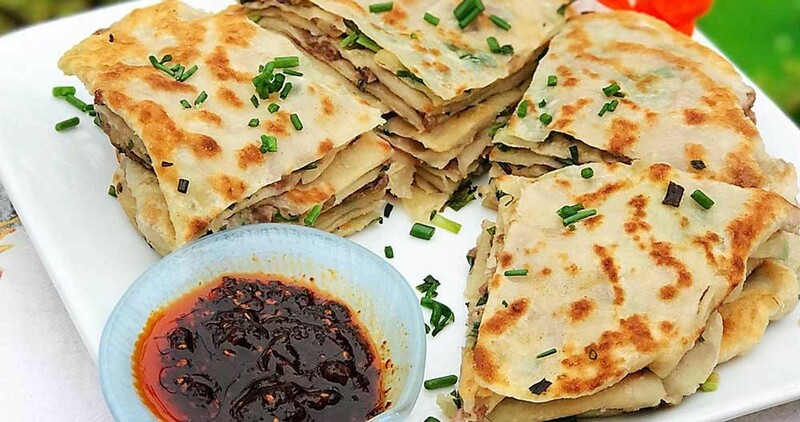 Their favorites are scallion pancakes wraps, lumpia and sub sandwiches. On some weekends, my boys request scallion pancakes and rice soup for lunch. I usually let my youngest son make the dough and we roll the pancakes out together. Traditionally they're served with spicy hoisin sauce but my kids like to wrap up leftover meat or fried eggs in them and — to my amazement — squeeze ranch dressing or ketchup on them. 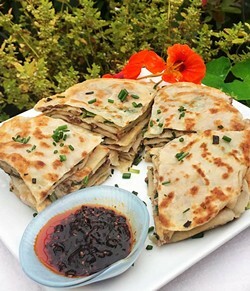 Lately I've started adding ground meats or vegetables in our scallion pancakes. The boys think they're the best hot pockets they've ever had. I love biting into the flaky dough and savoring the salty, spicy meat and green onion combination. Dipping them in my spicy garlic and hoisin sauce mixture ("Homemade Silver Pin Noodles," June 14), adds another level of enjoyment. First, prepare the dough. Using chopsticks or a fork, mix the flour with 1 cup of warm water until thoroughly combined. Add the rest of water 1 teaspoon at a time, kneading until it forms a soft dough. Let it rest at room temperature for 1 to 2 hours. After the dough has rested, add 1 tablespoon of oil and knead it for few minutes until it's pliant. Set it aside for another 15 minutes. While the dough is resting again, make the roux. In a pan over medium heat, warm the oil. Add the garlic and onion, stirring until browned. Discard the garlic and onion, pour the infused oil into a heatproof bowl. Add the flour and mix into a paste. Set aside. Next, make the filling by adding the garlic salt to the ground beef and mixing well. To assemble the pancakes: Divide the dough into 6 equal portions, rolling them into balls. On a lightly floured surface, roll each ball out into a thin circle. Brush the discs on each side with 1 teaspoon of the roux. Place 2 teaspoons of the beef, 2 tablespoon green onion and 1/3 teaspoon of the spice mixture in the center of each disc, leaving room at the edges. Fold the edges toward the center and pinch them to seal completely. Using a rolling pin, gently flatten the stuffed pancake out as thin as you can without breaking them. In a frying pan, heat 1 tablespoon of oil over medium-high heat. Fry 1 to 2 pancakes at a time until both sides are golden and crispy. Cut them into quarters and serve with spicy garlic and chili sauce or eat them plain.